The rugged island of Sumbawa in West Nusa Tengarra is a remote yet beautiful place. Located to the east of Lombok, Sumbawa is just waiting to be discovered. It may take longer to reach but once you get to Sumbawa you’ll be rewarded with excellent surf and incredible views. The slogan of Sumbawa tells you all you need to know about this island. B E S A R stands for Bersih, Elok, Sehat, Aman Damai, Rapi (Clean, Beautiful, Healthy and Neat). Because this is a rural destination, Sumbawa lacks the tourism infrastructure of nearby resort islands Lombok and Bali. Visit here if you have a thirst for adventure and want to get a truly authentic experience of local culture. The pace of life in Sumbawa is slow. Local people are predominantly Muslim but traditional beliefs and practices also continue to influence daily life. There are two main cultural groups on Sumbawa, the Tau Samawa in the west and the Dou Mbojo in the east, with an added influx of Sasak from Lombok. In parts of Sumbawa, traditional ways of living continue today. Many of the ritual events of old ways are still performed such as water buffalo racing and berempuk – a ritual boxing match. Sumbawa horses and ponies are as famous in Indonesia as those of Sumba, and I have seen a number at Bali Equestrian Centre. In Sumbawa, races are run with jockeys as young as 5 years. If you want to see a variety of local horses, then the Bima Horse Fair is the place to be. Other festivals to visit on Sumbawa are the Moyo Festival, usually held in September, Samawa Intan Bulaeng Festival and the Lakey Festival. At the Moyo Festival one may hear a combination of 850 Sunai flute players performing simultaneously, telling ancient stories through their instruments. Moyo Island is part of Sumbawa and because of its remoteness, is frequented by rich and royals looking for a private holiday. It is usually reached by sea plane, but can also be reached via boat; Amanikan Island Cruises is one of the few sailing ships that offers trips to the island. The unique and colourful Mbojo fabrics of Bima are a part of the area’s rich heritage, giving an insight into the individuality of the people of Bima. The history of the colourful garments goes back to the time of the Sultanate of Bima, one of the Islamic empires which had a considerable influence in Eastern Indonesia. Every woman of the Mbojo tribe was expected to learn this ancient craft. Mothers who had not trained their daughters felt ashamed that they had failed in an essential duty. The government is trying to revive the industry as a tourist attraction. Previously “rimpus” used to be exported to the Moluccas, Kalimantan, Java, Sumatra and even Malaysia and China. Most are warn as traditional Muslim female attire, a combination of the clothes making a sarong and the headgear. For the fit and adventurous, a hike up Gunung Tambora is a must. One of 127 active volcanoes in Indonesia, Tambora last erupted in 1814, causing a blackout across the earth which caused a whole summer to be missed Europe. Although this caused hardship in Europe, the worst was in Sumbawa, where 100,000's were said to have died. Despite all the traditions, the island is best known for its waves, sandy beaches and wild terrain. With great surf and spectacular coral reefs, the majority of travellers to Sumbawa come to surf and dive the renowned surfing spots. Surfers will flock to Maluk village where a superb white sand beach and turquoise waters can be found. If you are a pro surfer try the famous Supersuck on the west coast – a reef break that gives rides up to 100 meters long. Sumbawa’s surf areas can be roughly split into two zones – the western coast and the cluster of waves near Lakey Peak in Sumbawa’s east. The surf at Hu’u and Lakey beach attracts surfers from around the world. The best surf is between June and August. Ask about “periscopes”. Sumbawa receives the same swell as other areas in Indonesia – the dry season (April-November) features the most swell. For the west coast breaks, the SE trades during the dry season blow offshore. These same winds blow sideshore at Lakey Peak, so early morning surfs are the go before the wind picks up and the waves are still offshore. The wet season is typified by smaller swell and West and NW winds. Some of the south coast breaks can be working at this time. Aman Gati Hotel is the finest Hotel & Villa Accommodation at Lakey Peak and is owner-operated. A true Paradise Resort where surfers can "Live the Dream" 5 World class waves within walking distance and more just a bike or boat ride away. This unique area produces ideal conditions for all ocean adventure sports: Surfing, Kite Surfing, Game fishing, Diving and Snorkelling, Kayaking, whale and dolphin watch tours or simply relaxing on the beach or poolside with family and friends. Scar Reef Villa, opened in October 2011, is the only place to stay in West Sumbawa. The exclusive Scar Reef Villa is now open for business. Partama will take you away from the crowds to remote locations on Sumbawa. You’ll surf world class waves and enjoy all the pleasures of travelling to exotic islands on a fully equipped Balinese-built outrigger boat. After taking surf charters to this area for the last 20 years, the Partama crew have extensive local knowledge of the waves and local waters. The 2m Partama was custom built from timber brought in from Sulawesi, the boat capital of Indonesia. It has a cruising speed of 8 to 11 knots. Due to its large outriggers attached to the sides, the boat is very stable in the water. Takes 9 – 11 surfers. To get to Lakey Peak you need to fly to Bima Airport in east Sumbawa. There are daily services from Bali, and a roundtrip flight will cost approx US $195.00 per person. From here you can take a taxi-bemo (public transportation) to Hu’u, about a 3 hour drive, for about Rp 400.000 per person in a car, or private transfers can be arranged for about Rp. 1.250.000 per vehicle (maximum 4 people) one way. 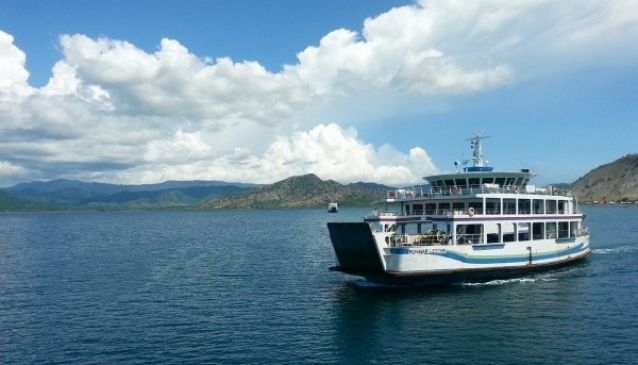 To reach the West Coast resorts, fly from Bali to Lombok, then take the overland route to Labuhan Harbour where you can take a ferry to Poto Tano in West Sumbawa (approx.. 70 mins.) Or you can take a fast boat from Lombok. Some resorts can arrange a private sea plane from Bali directly to Sumbawa. If you want an all-done-for-you surfing trip, click here.